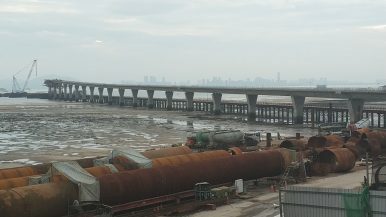 A bridge is under construction between Kinmen and its outlying island (Lieyu or "Little Kinmen"), but plans for a bridge to Xiamen, seen in the background, are a non-starter for Taiwan's central government. 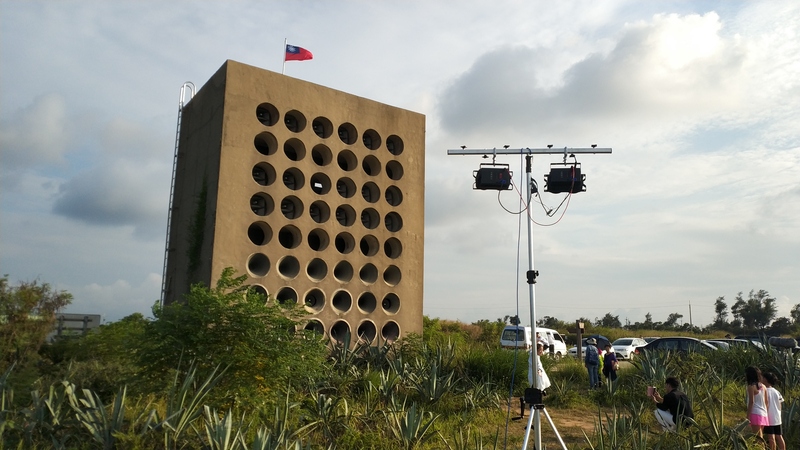 On August 26, Kinmen Island’s Beishan Broadcast Wall, a relic of Taiwan’s decades-long Cold War standoff with the People’s Republic of China (PRC), was reactivated. From 1967 to the late 1970s, during the height of conflict, the three-story tower blasted propaganda and songs by Taiwanese pop star Teresa Teng across the Taiwan Strait toward the nearby farming villages of China’s Fujian province. But after the United States switched its recognition from the Republic of China to the PRC in 1979, and Taiwan subsequently transitioned from martial law into a democracy, the wall grew silent while the gleaming city of Xiamen burst from the once-quaint Chinese shoreline. The wall was not reanimated for long; it was used by a collective of artists who incorporated a cacophony of sound, silence, and Teng’s old standards at a modest decibel level – most of its loudspeakers, after all, are no longer functional. Observers snapped pictures and shared them to Facebook and Instagram, both blocked just across the water from this island of about 160,000 residents. Artists stand outside the Beishan Broadcast Wall, once used to blast propaganda at Mainland China. Photo by Nick Aspinwall. The event coincided with the 60th anniversary of the Second Taiwan Strait Crisis, in which the People’s Liberation Army (PLA) tested U.S. support of Taiwan by relentlessly shelling Kinmen, memorably inserting the island into the 1960 U.S. presidential campaign. The artists were careful not to politicize their performance – lead composer Augustin Maurs called it a “message of peace” – but in Kinmen, just six kilometers from Xiamen and over 300 kilometers from Taipei, enmeshment in cross-strait relations is a geographical fact of life. The Kinmen county government is now proposing what it calls its “New Three Links.” Along with the pipeline, it wants to connect with China’s electricity grid and build a road bridge between Kinmen and Xiamen. “We want to become a peninsula,” said Wu. Now the island’s second-in-command, the longtime Kuomintang (KMT) legislator has pushed for the New Three Links throughout his decades-long political career, insisting they are vital to Kinmen’s economic health. But they are non-starters for President Tsai Ing-wen’s ruling Democratic Progressive Party (DPP), which has refused to affirm the “One China” consensus as Beijing, under Xi Jinping, has intensified its campaign to control what it regards as a renegade province. The original Three Links resulted from China’s belief that they could be used to hold onto Taiwan, according to former DPP legislator Lin Cho-shui, and Tsai has little interest in physically appending her territory to Chinese soil. Nonetheless, he is undeterred. He says the projects will decrease Kinmen’s reliance on its severely limited freshwater reserves and its expensive (but heavily subsidized) electricity – both of which he believes are necessary to support a growing population and increasing Chinese tourism. If Wu gets his way, an influx of permanent residents from China will follow. He wants to allow the use of Chinese renminbi in Kinmen and loosen strict restrictions for Chinese nationals buying property on the island – and, he hopes, double Kinmen’s population to about 300,000 in the process. 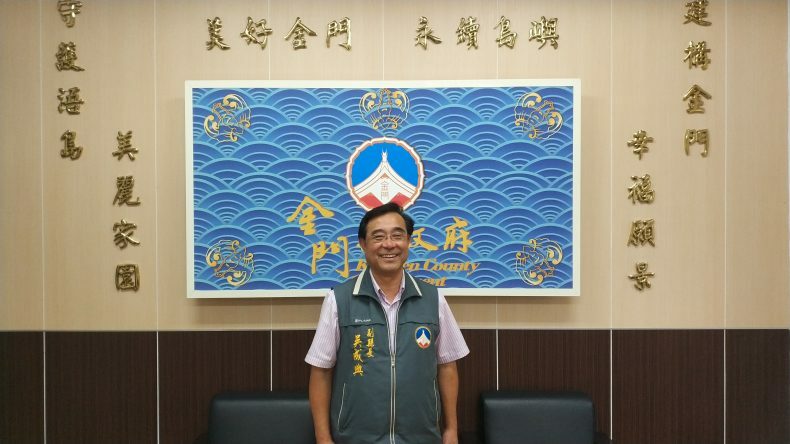 Kinmen County Deputy Magistrate Wu Cheng-dian. Photo by Nick Aspinwall. Her stance landed with a thud in Kinmen, where DPP candidates regularly get 10 percent or less of the popular vote. While Kinmen County is staunchly pro-KMT, its residents were hardly loyal to former President Ma Ying-jeou, whom they likewise saw as distant and disinterested in Kinmenese affairs. As of late, however, Tsai has not styled herself a popular figure on the island. Kinmen held it anyway – with a caveat. “We had a ceremony, but we didn’t call it a ceremony,” said Wu. Annette Lu, a former DPP legislator who was Taiwan’s vice president under Chen Shui-bian, recently panned Tsai and Vice President Chen Chien-jien for failing to show up to the 60th anniversary of the 823 Artillery Bombardment, in which the PLA sparked the Second Taiwan Strait Crisis by shelling Kinmen, killing 440 ROC soldiers. Lu minced no words, calling the administration “cold-hearted and indifferent” toward its outlying island. The vice president did arrive in Kinmen a day later – but to take a family vacation, donning a cap and mask to avoid recognition while visiting tourist sites. Kinmen Kaoliang, a distilled sorghum wine, has fueled the island’s economy since the 1950s. Photo by Nick Aspinwall. After tourism, mostly from the Chinese mainland, the main engine of Kinmen’s economy is Kaoliang, a distilled liquor made from fermented sorghum. 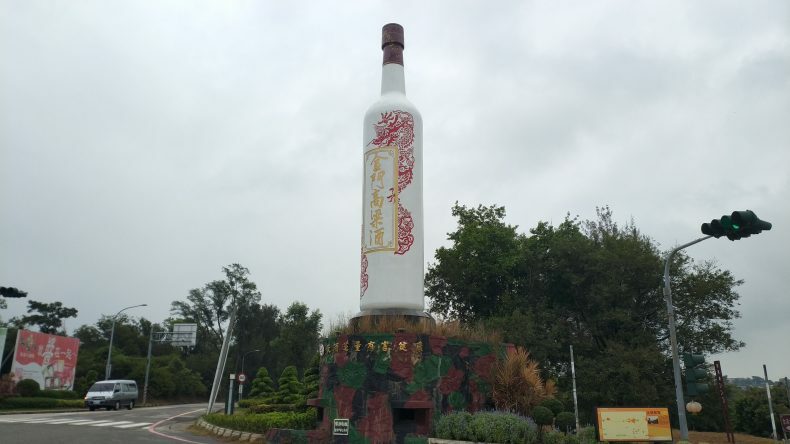 Usually sold at 38 percent or 58 percent ABV, the local firewater’s publicly-held manufacturer provides extensive social benefits to Kinmen residents, including free public transportation, free lunches for schoolchildren, and heavily subsidized higher education. Most famously, islanders over 20 enjoy the opportunity to purchase duty-free Kaoliang three times a year, on national holidays, which they often resell for a profit. The benefits attract new residents – since 2012, Kinmen’s population has swelled by about 4 percent annually – and keep existing inhabitants on the island, letting them live in peace while exploring opportunities across the strait. In a fifth-floor conference room in Kinmen’s National Quemoy University, a poem by the late poet Lo Fu, who served as a naval officer in Kinmen, reads: “The sound of opening a bottle of liquor is better than the sound of pulling a trigger.” In Kinmen, this functions quite naturally as a formative educational philosophy. Established in 1997, Kinmen’s flagship university recruits Chinese students “to come here and learn democracy, to voice themselves freely,” said Yen. Rather than quarreling, domestic students regularly invite their Chinese classmates to visit their hometowns in Taiwan. “Students here do not usually talk about politics,” said NQU Vice President Horng Ji-hwei. Nevertheless, the university is inexorably governed by them. NQU accepted 30 new Chinese students for the upcoming school year out of over 750 applicants. He believes his university can accommodate up to 1,000 students from the mainland, but the school is limited by restrictive quotas that have shrunk further under the Tsai administration. 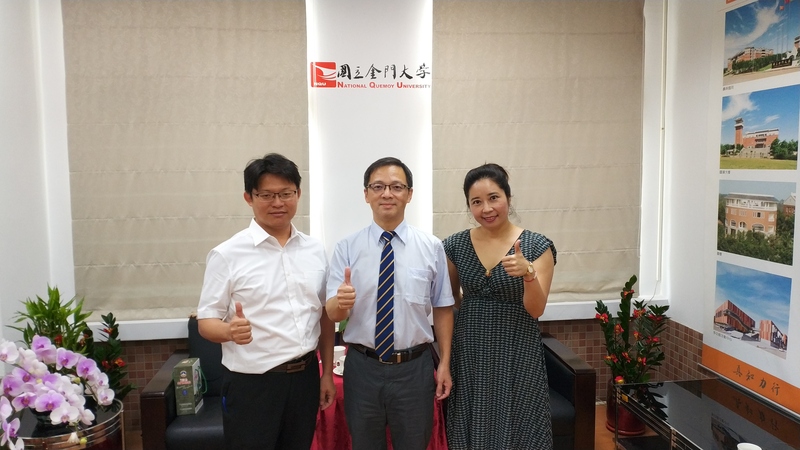 National Quemoy University Department of Tourism Management Associate Professor Peter Tsai (left), Vice President Horng Ji-hwei (center), and Department of Business Management Professor Yvonne Yen (right). Photo by Nick Aspinwall. Despite this, the university itself serves as a link, as many NQU students arrive from Taiwan with ambitions of crossing the strait themselves to pursue life in China. One second-year business student from Chiayi told me he came to Kinmen as a first step to find work in Xiamen, where his sister is already studying. Yen, also a Chiayi native, has lived in Kinmen for 21 years. She arrived shortly after martial law was lifted in 1992 – before which curfews were enforced and streetlights were dimmed every evening to hide the island from potential PLA invaders under the cover of darkness. Now, when garbage from China washes up onto the beaches – “We can tell by the simplified characters,” she laughs – her students pick it up and happily send it back. “Kinmen should become a bridge of peace between Taiwan and Mainland China,” said Chou Yang-sun, a professor of Chinese affairs at NQU. He insists that the New Three Links are “the best choice” to alleviate cross-strait tensions. Chou, who also served on Taiwan’s supervisory Control Yuan, understands that Kinmen’s needs differ from the national government’s priorities. He wants Kinmen to adopt “segmental autonomy,” a model in which minority populations have decision-making power over matters of their exclusive concern, citing Finland’s autonomous Åland Islands as an example. Chou periodically advises Taiwan’s unification-skewing New Party, but he insists that he is not advocating for Taiwan, or Kinmen, to rejoin China. Instead, he wants Kinmen to get what it can out of the ROC structure. 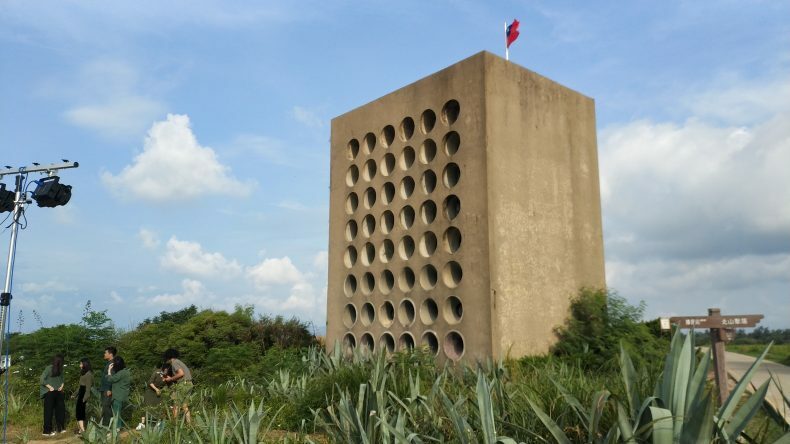 Chou wants to see Kinmen become “a memorial park of the Cold War,” and to venture around the island is to experience an open-air museum exhibiting the scars of cross-strait conflict. Steel barricades to prevent water invasions still adorn the beaches. Tanks and plaques lie aside streets. The island is loath to forget its history, and it cringes when the two sides seem to inch closer to a renewal of conflict. 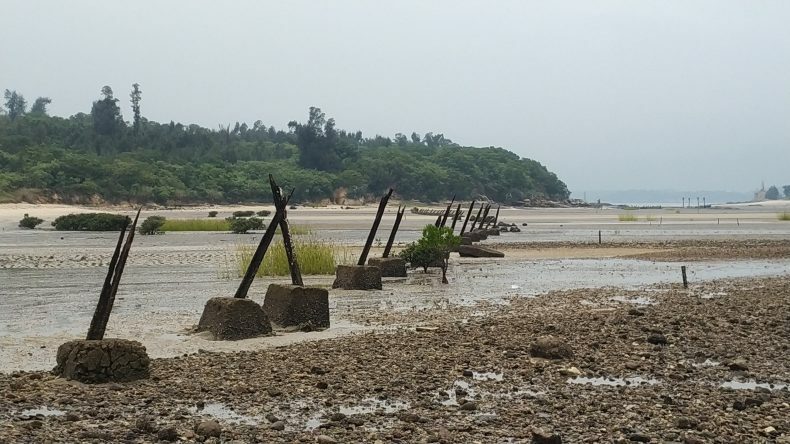 Steel barricades, once used to prevent amphibious invasions, still adorn many Kinmen beaches. Photo by Nick Aspinwall. At present, Kinmenese are eager to enjoy what is a delicate peace, rattled with every cross-strait escalation. For now, they revel in moments like the Beishan Broadcast Wall performance, which bring back the memories of war and reemphasize how far Kinmen has come. Such is life on this island, where the past and present coexist in harmony, and the future glistens just six kilometers out of reach as the lights of Xiamen’s prosperity dance with the stars upon nightfall. Just as Kinmen’s wall once beamed agitprop toward China, Xiamen’s gleaming skyscrapers now broadcast a vision of unbridled growth to its immutable cross-strait neighbor. Completed in 1967, the Beishan Broadcast Wall could beam its messages over 25 kilometers into China. Tsai Ing-wen's popularity is falling amid pressure from Beijing and economic uncertainty. The Tsai-Trump Call: The Dynamics in TaiwanThe Mood Ahead of Taiwan’s Midterm ElectionsAfter the Call: Does Taiwan Have a Plan for the Trump Years?Tsai Ing-wen’s Limited Options on Cross-Strait RelationsTaiwan: Can Tsai Ing-Wen Change the Politics of Death?